Since 2009, countries in the Eurozone (and others such as the UK) have pursued deflationary fiscal policy – reducing spending and increasing taxes to reduce their budget deficits. These austerity measures have led to sharp falls in the rate of economic growth, suggesting the negative multiplier effect is larger than may be expected in usual situations. As a rule of thumb, the IMF expect a fiscal multiplier of 0.5. This means if you tighten fiscal policy by 1%, you can expect a fall in the rate of GDP growth by 0.5%. For example, the UK has tightened its cyclically adjusted budget balance by 3.8%, and (Real GDP % growth – trend) fell by 3.9%. This suggests a fiscal multiplier of 1.0. However, in other countries such as Ireland and Spain, the fiscal tightening led to a bigger fall in GDP giving a fiscal multiplier of over 2.0. This suggests in the current climate of the Eurozone, fiscal tightening comes at a big cost. What Determines Size of Fiscal Multipliers? Depreciation in the exchange rate. If a country pursues fiscal tightening but monetary loosening there is likely to be a depreciation in the exchange rate. This makes exports cheaper, and imports more expensive. This helps to boost domestic demand. External Demand. It is usually easier to tighten fiscal policy if neighbouring countries are growing strongly. Export demand can help overcome the fall in government spending. Situation of the economy. If there is spare capacity, then fiscal tightening is likely to cause a bigger negative multiplier effect. This is because the shock of falling demand is harder to absorb. If the economy is growing strongly, fiscal tightening may help reduce inflation and be easier to absorb. Confidence. If austerity measures improves confidence in future public finances, people may continue to spend. But, it is more likely austerity worsens confidence because of headline concerns over jobs and spending cuts. There is no ability to depreciate their currency. External demand is weak because of the global economy and Eurozone recession. The ECB’s focus on low inflation means there is no monetary expansion to offset the fiscal shock. Bond yields in the Eurozone have been higher than you might expect because of the dynamics of a single currency. This has meant they have spent more on interest payments making it harder to reduce deficit. 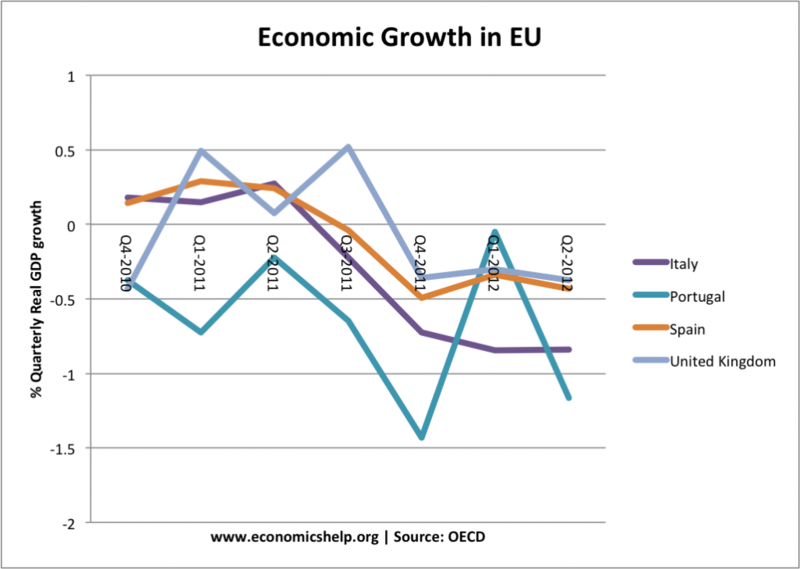 Since 2011, Europe has continued on a path of austerity, and in some cases austerity has been accelerated – and also joined by new countries like France. There is likely to be further falls in economic growth in the coming months. Austerity will be a lot of pain, but not much gain. The UK fall in GDP could have been worse, but it shows limitation of Q.E. to expand economic growth. If countries pursue fiscal tightening and see a large fall in GDP, at what point does fiscal tightening became revenue neutral? e.g. austerity reduces economic growth so much, tax revenues fall. Of course, there are other factors affecting economic growth apart from fiscal policy. For example, growth rates may be affected by the housing market and supply side factors. 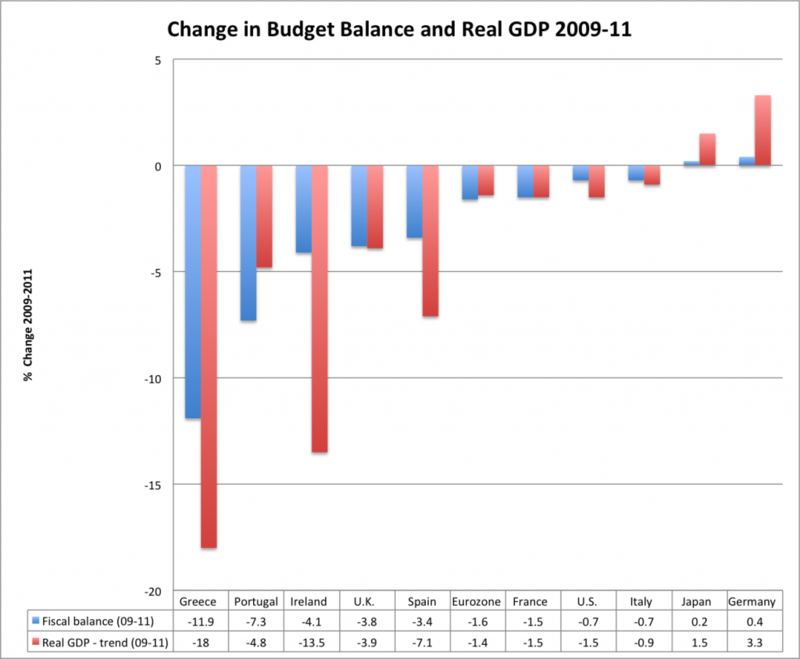 It is impossible to isolate just the effect of budget changes on Real GDP. But, there does seem to be a strong pattern which links fiscal tightening to lower real GDP growth. ← What Happens if a Major Currency Gets Backed by Gold? “As a rule of thumb, the IMF expect a fiscal multiplier of 0.5. This means if you tighten fiscal policy by 1%, you can expect a fall in the rate of GDP growth by 0.5%. The two paragraphs say very different things. The second does not mean a “fall in the rate of growth” but a fall in the level of GDP. Well spotted. Thanks The original data states the effect should be on Real GDP % change, so I updated 2nd paragraph.